FILE - Former CIA Director James Woolsey testifies on Capitol Hill, Aug. 16, 2004, in Washington. Advances in North Korea’s nuclear and missile programs are pushing the international community to respond with increasingly strict sets of sanctions, with the latest round, passed this week, capping the country’s oil imports while banning its lucrative textile exports. Despite the pressure, the Kim Jong Un regime continues to pursue the development of a nuclear-tipped intercontinental ballistic missile (ICBM) that could strike the continental United States, among other targets. 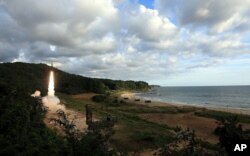 In this photo provided by the South Korea Defense Ministry, South Korea's Hyunmoo II ballistic missile is fired during an exercise at an undisclosed location in South Korea, Sept. 15, 2017. On Friday, for the second time in a month, the regime launched an intermediate-range ballistic missile over Japan’s northern island of Hokkaido. It traveled about 3,700 kilometers (2,300 miles) before falling into the Pacific Ocean, the farthest a North Korean missile has ever flown. Within hours, the U.N. Security Council condemned the “highly provocative” missile launch. Why is the North continuing its launches? Jenny Lee of VOA Korean spoke with former CIA Director James Woolsey to discuss the latest developments. Lee: North Korea’s missile launch on Friday came days after the passage of a new sanctions package by the U.N. Security Council. What do you think were Pyongyang’s intentions? Woolsey: The North Koreans wanted to shove themselves forward and say, “I am not intimidated by any sanctions. Leave me alone. I am a powerful nuclear power.” That’s their message. ​Q: How likely is it that the Kim regime has developed a functional ICBM and a miniaturized warhead? A: Probably not fully yet. But it doesn’t matter because they don’t need an intercontinental ballistic missile in order to attack directly the United States. They can do so with a satellite launch and [they] have nuclear weapons contained in the satellite that continues to circle the Earth a couple of times a day. ... So it does not take an intercontinental ballistic missile to reach the United States. You can do it fine with a weapon on a satellite. Q: You seem to be describing a nuclear electromagnetic pulse (EMP) attack. Could you describe how it works, and do you think the North Koreans currently have the capacity to carry out such an attack? A: I think it’s likely that they do. The destructive mechanism would be, it would not go directly against people, but would destroy the electric grid. It uses a detonation up above the Earth. It would not be targeted at a specific location, a specific building or an ICBM silo or something. It would knock out the grid generally. That means there would be no food, no water, no telecommunications and no hospitals. It would be a hideous situation. So that could be even more devastating than a nuclear attack that was targeted on individual locations. But having an ICBM that can be targeted on individual locations would give them more flexibility, and so I am sure they would like to have it. They are working on it, but in the meantime, in their hip pocket, I would say it’s hard to avoid the conclusion that they could use a nuclear detonation on a satellite in orbit to create the electromagnetic pulse. » What is an EMP? Q: Do you think North Korea is posing a serious threat at this point in time? A: I think it’s quite serious because it’s relatively easy to do. Orbiting a satellite is the easiest thing ... and a simple nuclear weapon that is about the size of a golf bag ... is not hard to fit on a small satellite like that. With a satellite you don’t have to worry about re-entry, re-entry shields, accuracy and a lot of other things that you have to worry about with ICBMs. Q: North Korea threatened to lob a missile at Guam at one point, and as recently as this Friday, it threatened to use nuclear weapons to “sink” Japan and reduce the United States “to ashes and darkness” for supporting new U.N. sanctions. Why is the North behaving this way? What are its intentions? A: They want to intimidate everybody else into making sure they get to hold on to their weapons, because they are convinced that that’s the only way that the Kim family can stay in power. They look at the history of Saddam Hussein, and the history of [Moammar] Gadhafi, and their conclusion is if we do anything to get rid of our nuclear weapons, we are doomed. So make sure we hold on to our nuclear weapons, and the best way to do that is to intimidate everyone and make them think that we’re right on the verge of using them. Q: When it comes to dealing with the North Korean nuclear issue, the Trump administration has emphasized its willingness to resolve it through diplomacy but also has left room for military options, such as preemptive strikes against North Korea. So, do you think the U.S. currently is on the right track? A: It’s hard to be on any other right now than to try diplomacy and hold military in reserve. ... You can’t think of an overall approach that would be superior to what we are doing now. But in the future, if things get worse, would we consider using force against them and could we do so successfully? The answer is — I don’t know. Q: The Trump administration is spearheading the effort to expand sanctions against North Korea and thereby isolate the country diplomatically and economically. Do you think they are sufficient to rein in the regime’s nuclear weapons program? A: It probably won’t get the job done, but they should do as much as they can. As the Russians and the Chinese move them off of their almost total embargo of oil to 30 percent embargo, they could continue to press to get more of it — an oil embargo. I think we’ve got to work with China and figure out how, together, we could get something done here, because the Chinese are the mainstay of the North Korean government. They are powerful and they are right next door to North Korea. And they have at least some inclination to work with us — not as much as I would like. So we are really left with China. There’s not much to do other than to try to work with them and bring them along into tougher sanctions and tougher positions.